Our kindergartener is into flags and geography. Whenever I’m looking at something on my WordPress dashboard, he always wants me to click on the stats page. “Can we see what flags are there?” he asks. (For those unfamiliar with WordPress, the stats page shows the flags of the countries from which visits to your blog originated.) We go down the list and he names the country that goes with the flag. I make him read the names of the ones he doesn’t know. He seems to enjoy this game, though it gets a little boring on days when all my blog hits come from the US and Canada. I love that he has an interest in these things because I like flags and geography too. More than that, I think that knowing where different places are makes you more interested in learning what happened (and is happening) there. In my book, a grasp of geography is vital to educating oneself about the world. It also leads to interesting mealtime conversations and creative fibs. I was not expecting this statement, as I did not know there was a particularly British way to take a drink. Naturally, I was intrigued. “How do they do it in the UK?” I asked. 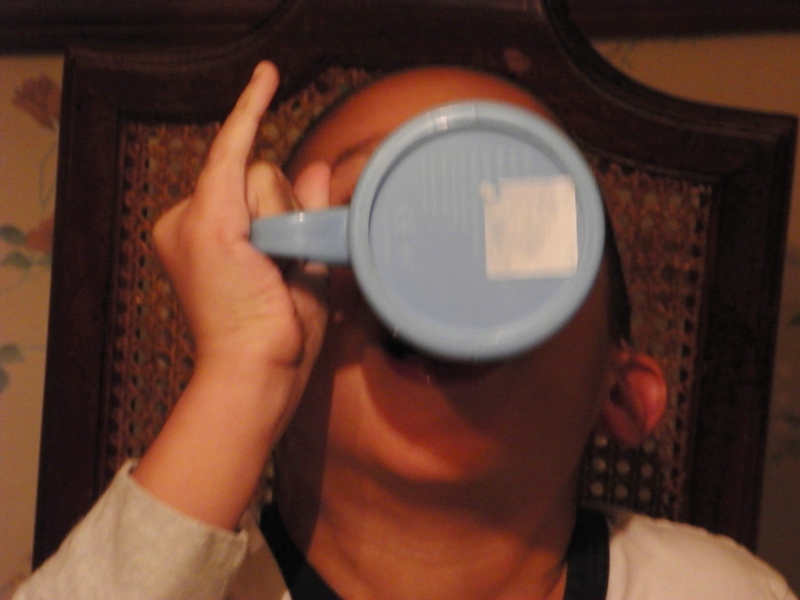 “Like this.” He lifted up his mug and conspicuously uncurled his pinky finger, extending it out straight, exactly as Queen Elizabeth might do if she ever sipped from a plastic mug with her name printed on it at high tea. He couldn’t tell me how he came to know such an interesting and amazing fact. He knew it in the way that kindergarteners know such things: he just did. Even with his low-brow family holding him back, he is determined to blossom into a society gentleman. 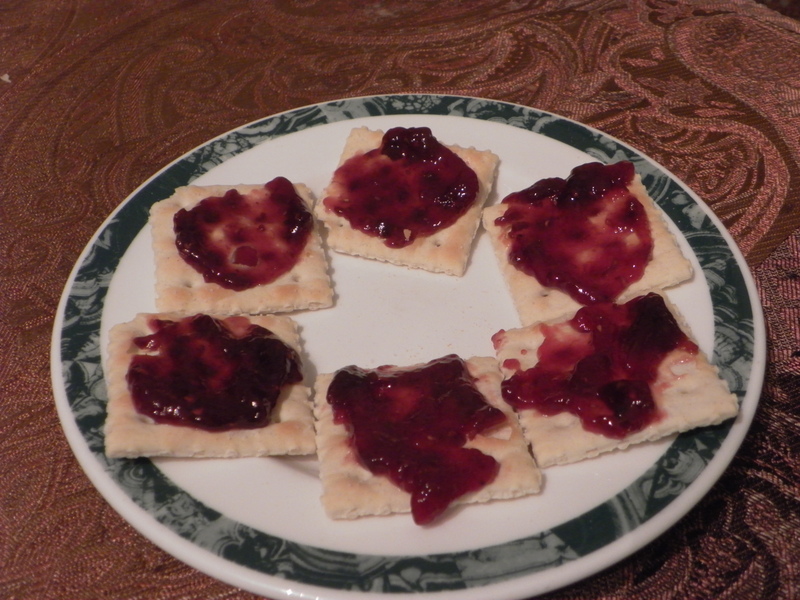 A few days later, at breakfast, I was spreading raspberry preserves on a saltine. “Can I have a cracker?” the boy asked. I offered him the one I had just spread. As part of the Marshall Plan, post-war Germans were forced to consume ersatz fruit spreads from America. Well, I guess that explains why I didn’t know about it. I’ve never been to Germany and I wasn’t even born when he went on his European fruit spread sampling tour. Maybe that’s when he popped over to have a drink with Queen Elizabeth and learned her people’s cup handling techniques. He shut me up. I handed him a plain saltine and for the rest of the meal I sat quietly, trying not to draw attention to the fact that I needed all of my clumsy, provincial fingers to lift my cocoa. This entry was posted in Little Weirdos and tagged children, Dads, Education, family, fatherhood, food, geography, humor, kids, parenting. ← Should I immunize my child against the scourge of adverbs? Or how much it will cost you. “I wasn’t even born when he went on his European fruit spread sampling tour” Hilarious. I begin the think I missed out on a lot of exciting times before I was born. Maybe you should check his room for hidden areas and gadgets. He may have some sort of Stewie Griffin thing going on in there! If he’s going back in time to taste fruit spreads, he’s wasting his genius. You might want to check on that again; I’ve never known a kindergartener to be wrong about something like this. I hope your kindergartener gets to see the Brazil flag today. Thanks to you, it’s one of them he recognizes. Here is a French flag for your kindergartener. If he can recognize even a dozen countries, he’s way ahead of the curve from most high schoolers. I spend some of my time trying to explain the difference between New England and the UK! I blame it on the pilgrims and their lack of creativity in naming places. I think I might have browsed too many of those creepy reincarnations stories because I immediately jumped to the conclusion that this was going to end with your bouncing baby boy having a past life as some well noted German a la Heinrich Mann (don’t know how he felt about jam though). 😉 Glad that wasn’t the case! I’d say Heinrich Boll, the way he tells stories. Either way, I’m setting up a rule that he’s not allowed to channel dead Germans until he’s 12. It does sound like you are holding him back a bit. I’m going to write another post about it next week but I’ve mentioned it before, take a look at postcrossing.com. He can get postcards from around the world! The cost to you is whatever a postcard costs and $1.10 for an international stamp. Send a postcard then receive one, the best part is you never know where it’s going to come from. It’s little addicting. Sounds like a neat idea. But I don’t know where he’s gonna get $1.10 from every time he wants to do it. Selling his toys on Craigslist?